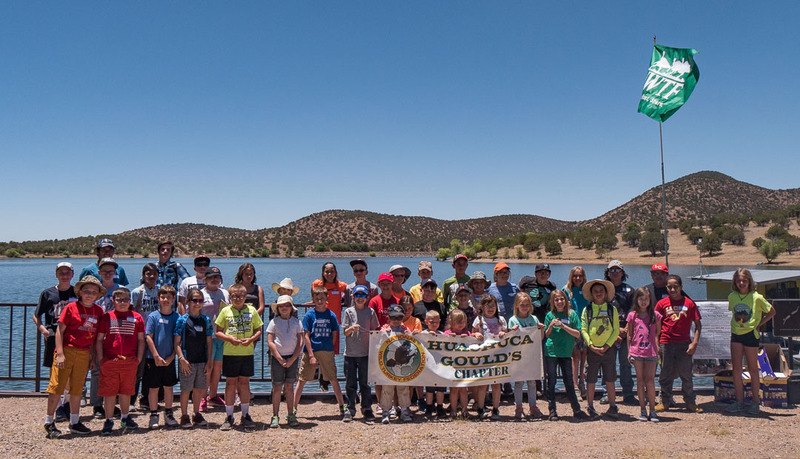 What: The Huachuca Gould’s Chapter of the National Wild Turkey Federation hosted a JAKES Day for area youth recently. 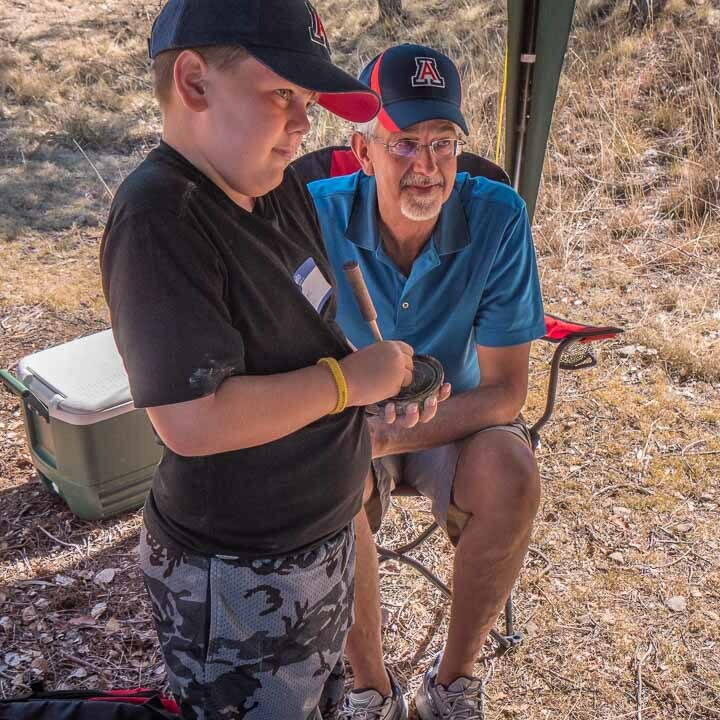 Forty-five participants learned various outdoor skills at 4 teaching stations. 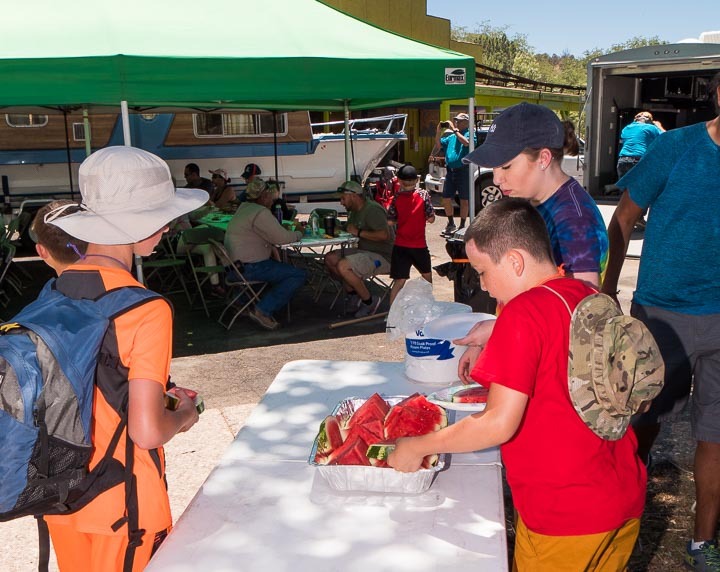 General Information: For the 11th year, volunteers from the Huachuca Gould’s Chapter offered a day of conservation skills and ethics for local youth. 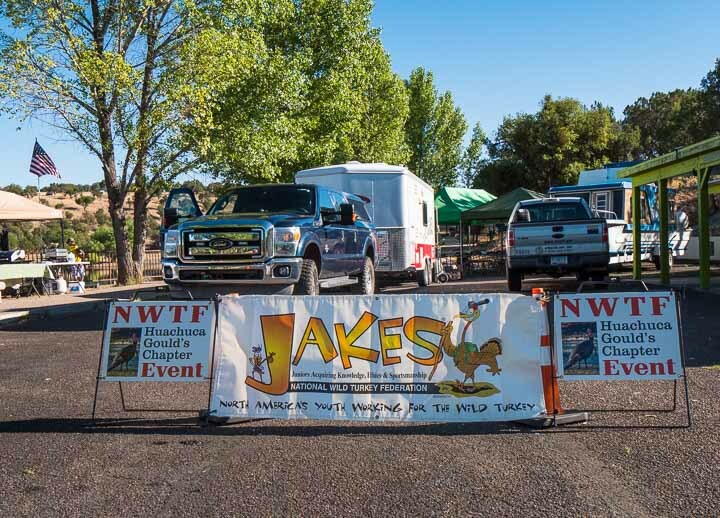 This JAKES event was supported by the Chapter’s annual banquet and the National Wild Turkey Federation. As always, there was no charge to the participants. JAKES stands for Juniors Acquiring Knowledge, Ethics and Sportsmanship. This year, 45 youths registered for the event. Ages of participants ranged from 7 to 15 years old with a couple of younger ones looking on. Local home towns included Benson, Sierra Vista, Fort Huachuca, and Hereford. Farther traveling JAKES came from Sahuarita, Tucson, and even Phoenix. 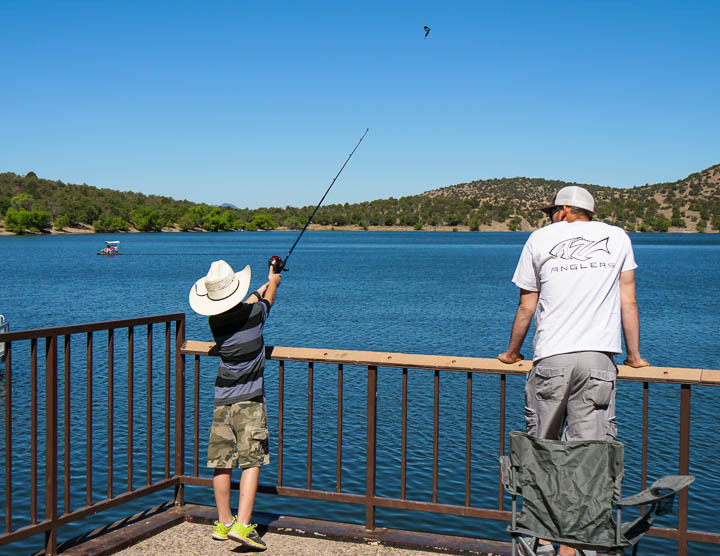 Parker Canyon Lake in the Canelo Hills of southeastern Arizona was the site of the JAKES event. This body of water sits at an elevation of just under 5400 feet surrounded by rolling hills of oak and juniper woodland. When full, the impoundment for the lake backs up about 130 surface acres of water. 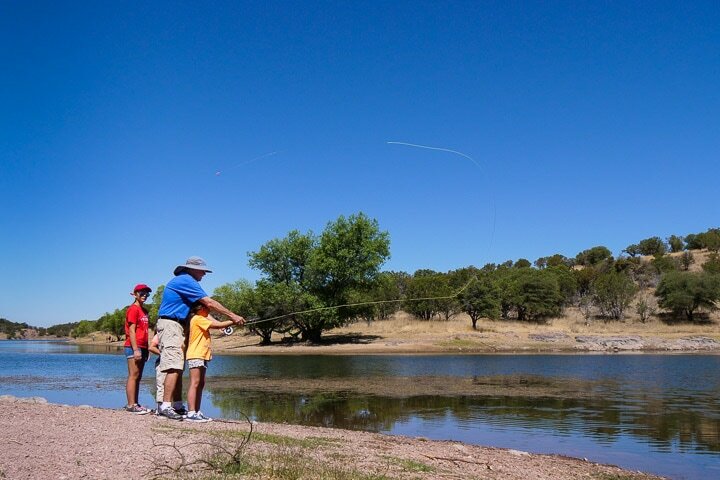 Besides being only 25 miles from Sierra Vista via a paved road, the lake holds 3 state records for trophy fish. The biggest is a Channel Catfish at over 32 pounds. Record Black Bullhead and Green Sunfish have been landed here, also. The weather, well, can only be described as mighty warm for a mid-June day in Cochise County. It was sunny with the high temperature in the mid-90s. At least a breeze (by southeast Arizona standards) coming off the lake and plenty of shade canopies kept the heat tolerable. A brief orientation followed the morning registration. Then participants divided into small groups and headed to 4 teaching stations. These stations were located at the marina and along the nearby lake shore. 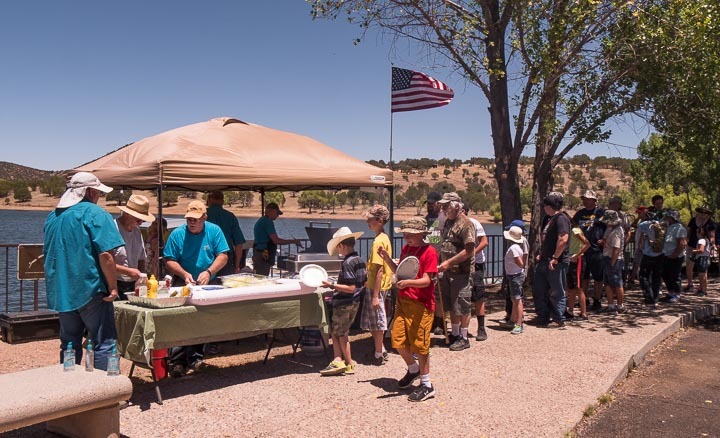 And what a great place Parker Lake was for such an event! At one station, Arizona B.A.S.S. 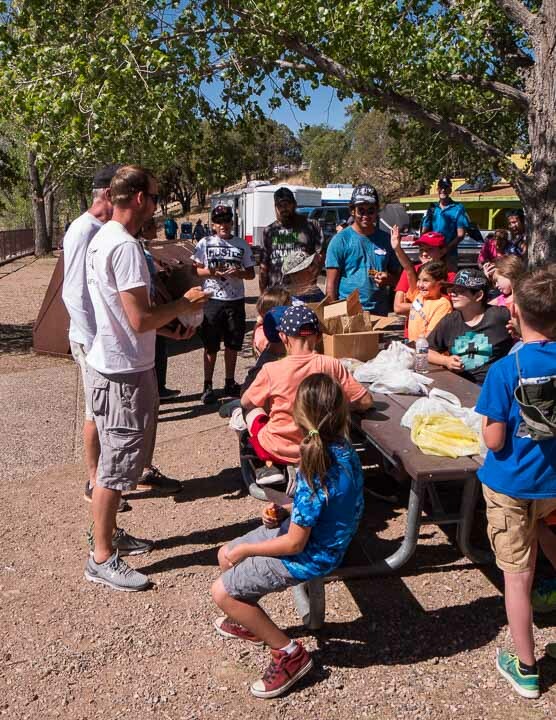 Nation conducted a casting, equipment, and knot tying clinic. 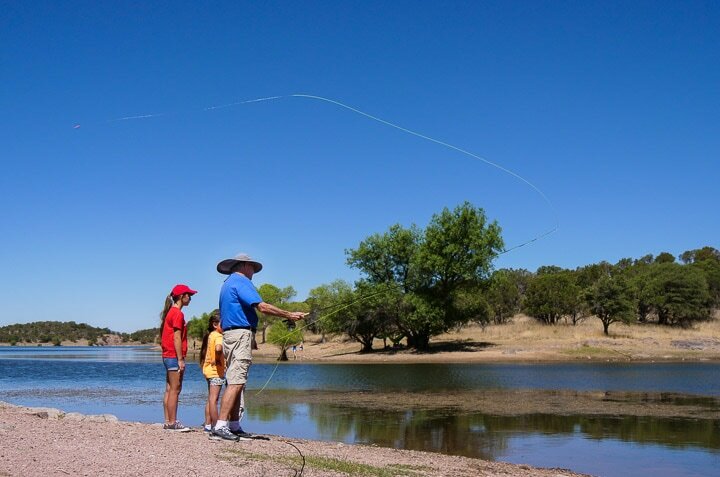 One skill taught was “flipping” a lure at bullseye marked mat. Fishing on the pro bass circuit was discussed from the top of a big-time boat as well. Land navigation and compass reading were taught at a second station. 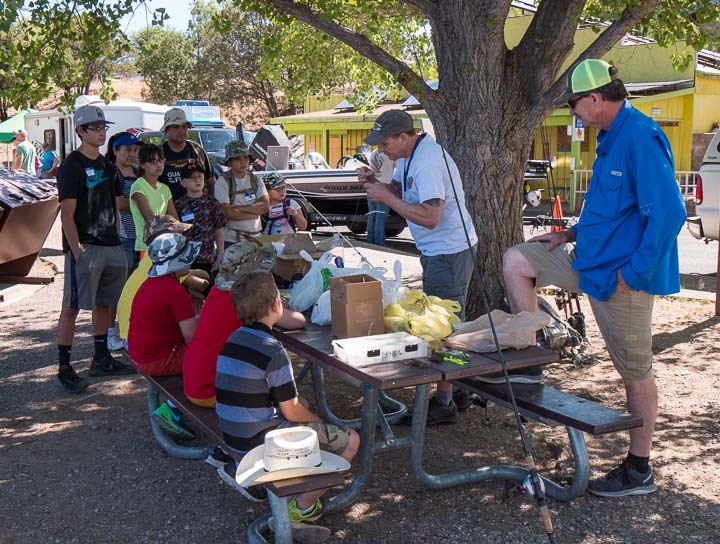 The San Pedro Fly Casters gave hands on experience in fly casting along the shoreline as part of the third station. 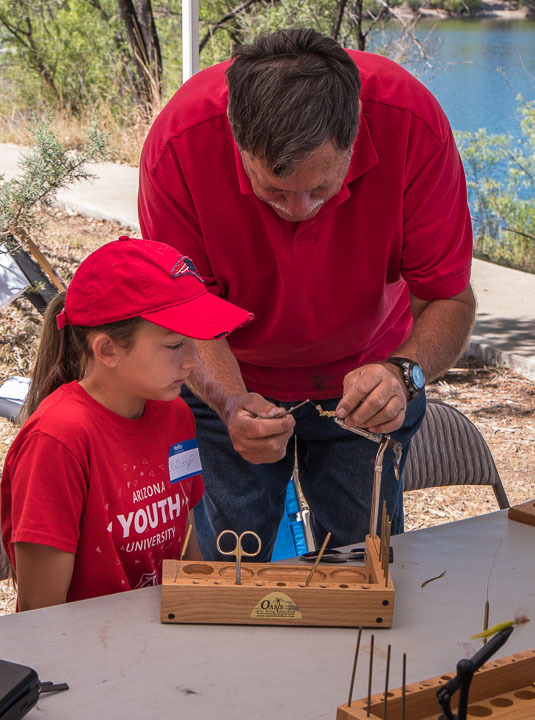 Other club members demonstrated the fine art of fly tying. For the fourth station, hands-on game calling was offered. 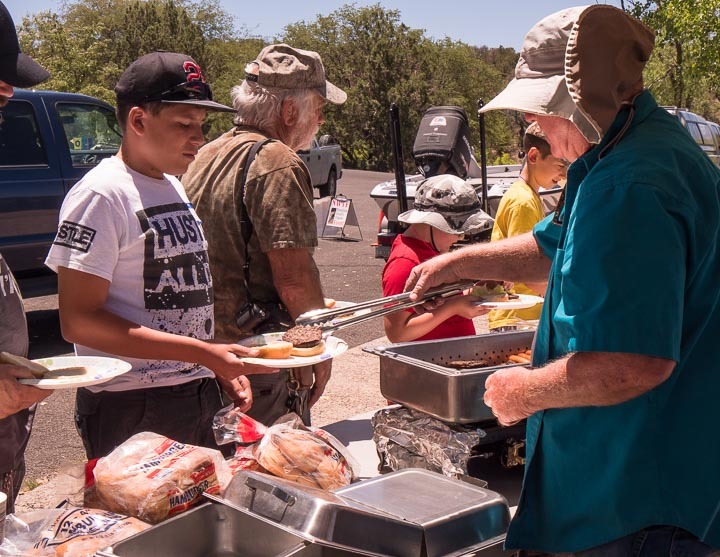 A delicious lunch of grilled hamburgers and hotdogs, chips, watermelon, and refreshments was provided at mid-day to the JAKES and their families numbering about 100. The chow line formed fast and the chairs in the shade were very welcome by the group! Next, participants posed for a group portrait on the marina with Parker Canyon Lake as a backdrop. After completing all the learning stations by early afternoon, the Arizona B.A.S.S. Nation raffled off donated equipment to the youth. And so another fun filled and educational day for JAKES and their families concluded. 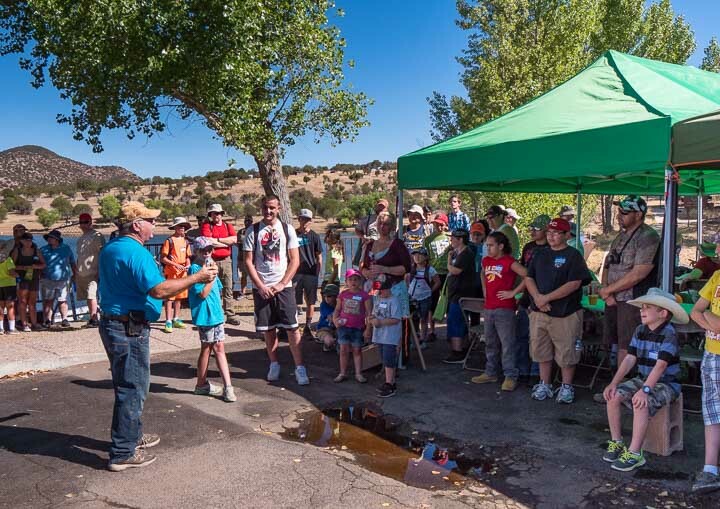 Wayne Kaiser, Huachuca Gould’s Chapter, did an outstanding job of organizing the event and coordinating with volunteers and presenters. 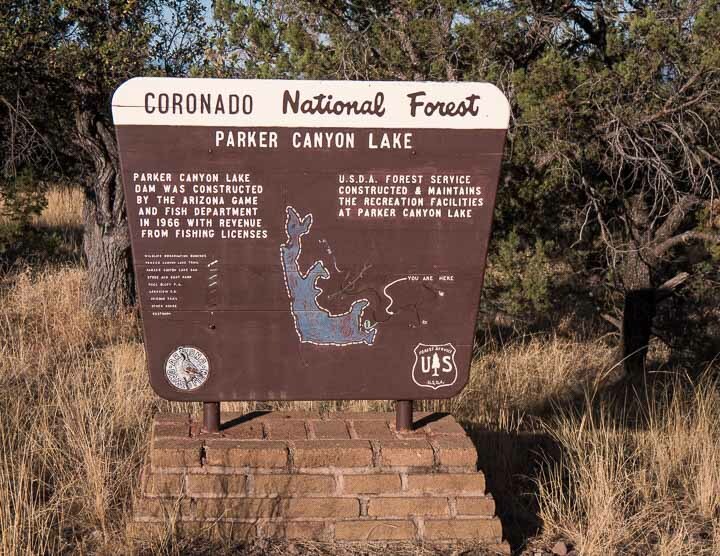 Thanks go to Scott Kerr of the Parker Canyon Lake Marina and the Coronado National Forest for use of the facilities. 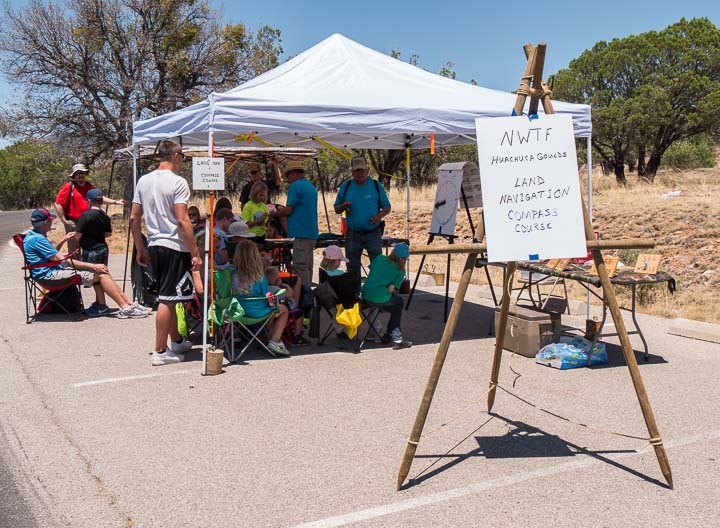 Several members of the Huachuca Gould’s Chapter deserve recognition for their assistance at the event, also. They were: Tom Fuller, Randy Keiller, Dave Inman, Lorin Kaiser, and Tom Deecken. And finally, a special thank you goes to all the parents, relatives, and friends for bringing a youth to JAKES Day! 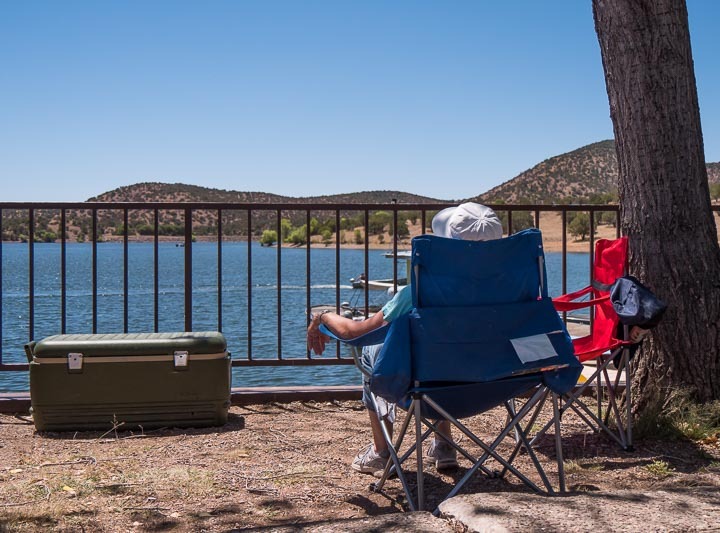 001 Getting Close- Parker Canyon Lake in Cochise County was the location for the 2017 JAKES event. 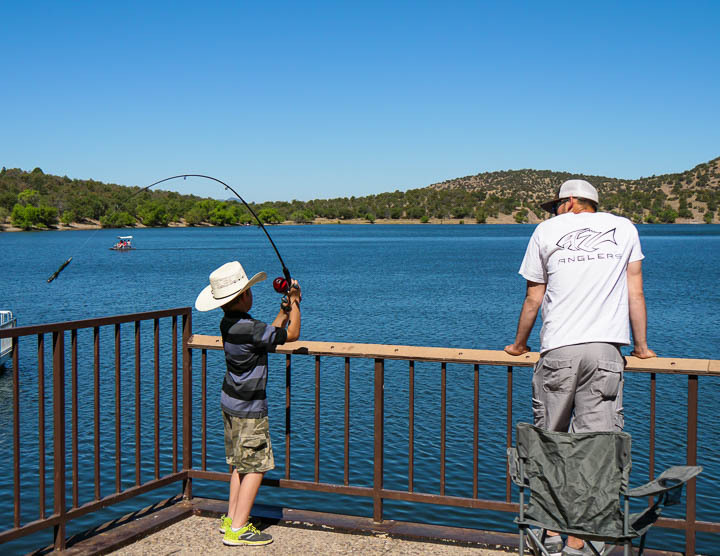 The lake sits at 5400 feet elevation on the southwest side of the Huachuca Mountains. 004 What Does JAKES Mean? Why, it stands for Juniors Acquiring Knowledge, Ethics, and Sportsmanship. That is just what the participants experienced at JAKES Day. 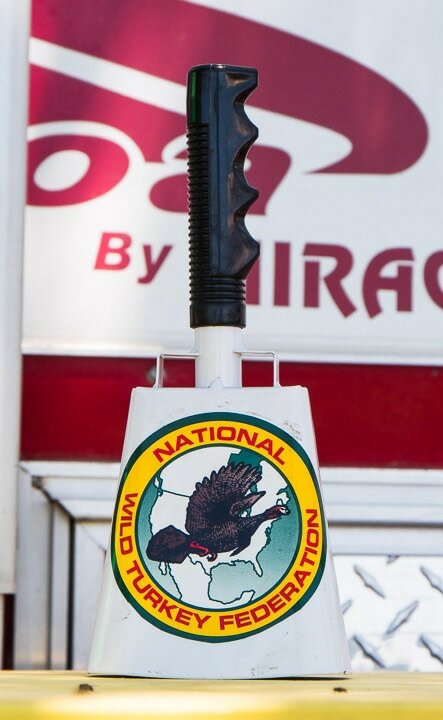 002 You’ve Arrived- The JAKES Banner and new Huachuca Gould’s event signs mean this is the place! 005 Registration- Lorin Kaiser and Randy Keiller (both seated at table) sign up some early birds. Wayne Kaiser (front) Dave Kemnitz (back in blue shirt) assists. 003 The Setting- The marina and nearby lake shore were the sites for the 2017 JAKES event. 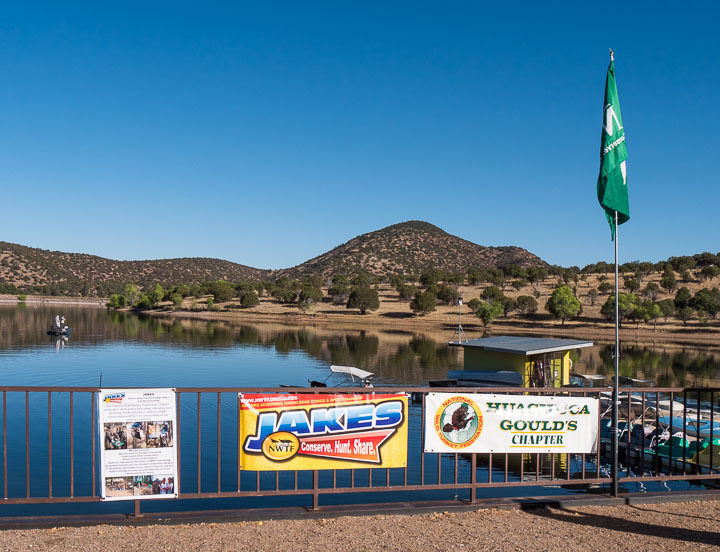 The Turkey Federation flag and banners for JAKES and Huachuca Gould’s Chapter are on display with an early morning, flat surface of the lake in the background. 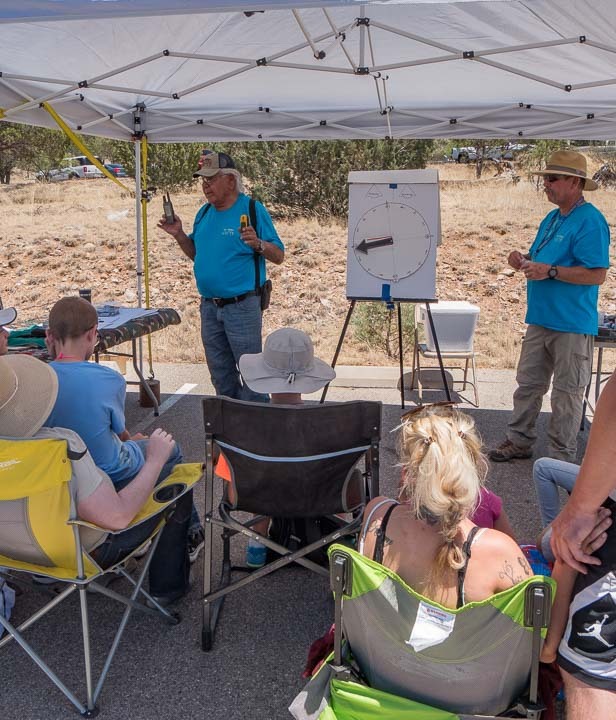 006 Orientation- Wayne Kaiser (left in blue shirt), event coordinator for the Huachuca Gould's Chapter, tells the JAKES and their families what to expect in the activities for the day. Having fun and being safe are tops on the list. 007 Knot Tying and Pole Rigging- Pat Hanning (white shirt) of B.A.S.S. 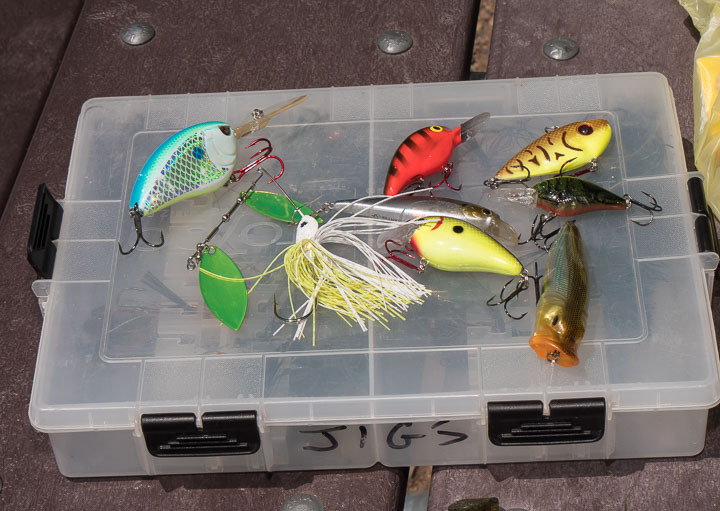 Nation demonstrates useful knots and rigs for different types of fishing. Greg Taylor (blue shirt) assists. 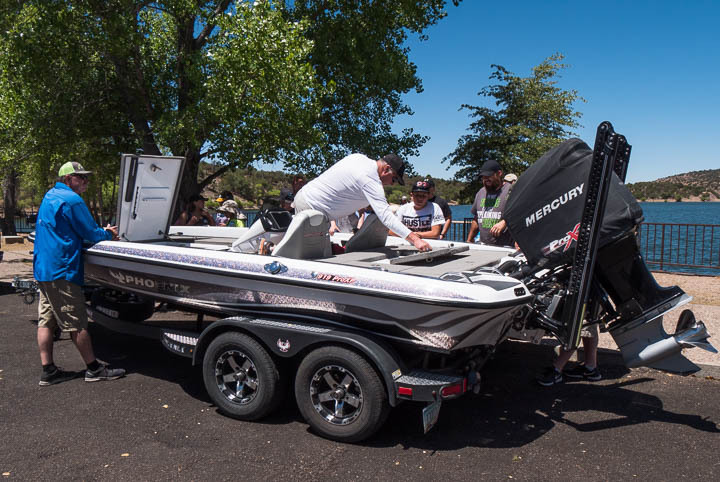 010 Big-time Bass Boat!- Gerald Kimzey of the Arizona BASS Federation discusses the equipment used in fishing tournaments. Greg Taylor (blue shirt) adds his experiences for the group. 013 The Mouth Calls- At the Game Calling Station, Wayne Kaiser talks about different types of mouth calls for Turkey and Predators. 008 Casting Part 1- A JAKE gives a mighty heave to his rod and the attached black crawler under the watchful eye of Jacob Shull of B.A.S.S. Nation. Basic casting was one of the skills acquired at this station. 014 Your Turn- A JAKE practices his Turkey calling with a friction/pot caller. 009 Casting Part 2- That black crawler on the end of the line starts its ascent into an earth orbit! 012 Practice What You Preach- As the JAKES look on, Greg Taylor of B.A.S.S. 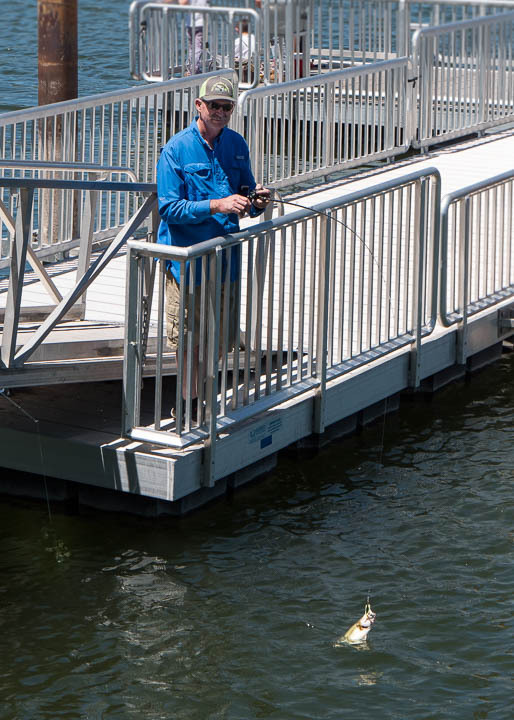 Nation pulls in a nice Largemouth Bass from the fishing pier. 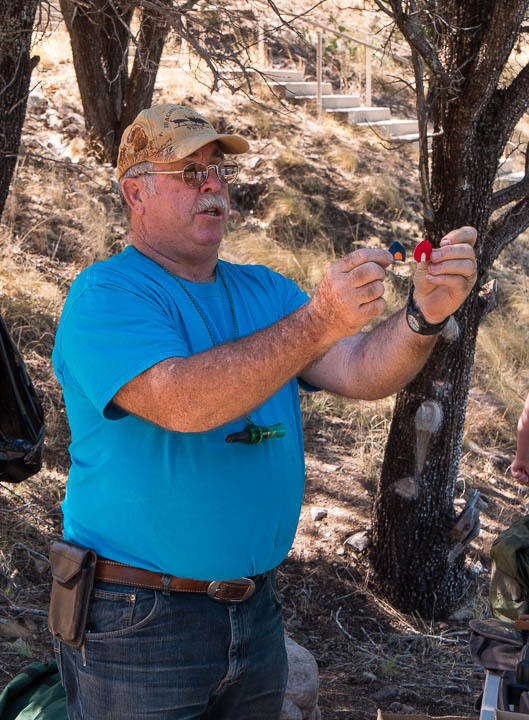 He was demonstrating retrieval methods for the group. They work! 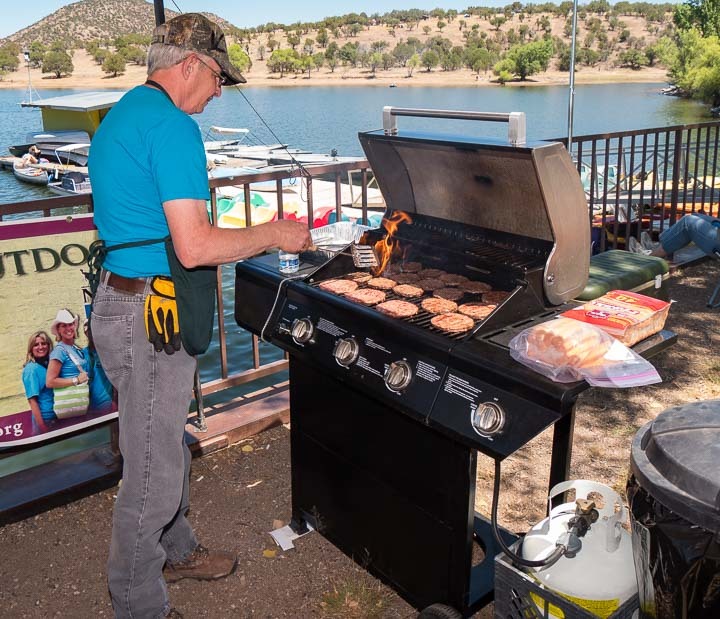 015 Grill Work- Meanwhile, Dave Inman grills the hamburgers and hot dogs for the hungry JAKES and adults. Tom Fuller assisted. 017 The Line Forms Here- When the Dinner Bell rings, the lunch line forms quickly thereafter! 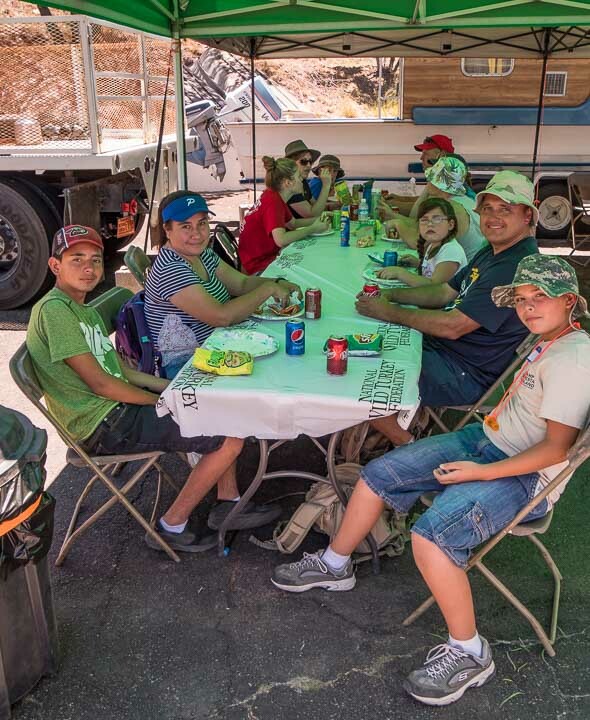 020 The Alvarez Family Shades Up- The big canopy provided welcome shade for the Alvarez Family at lunch time. 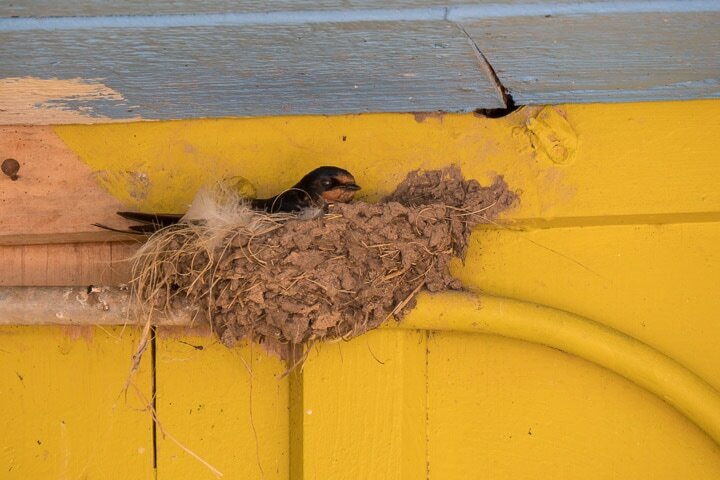 021 The Barn Swallow Family Shades Up, Too- Meanwhile under the roof of the nearby Marina Store, a Barn Swallow and young seek relief from that mid-day sun. 022 Land Navigation and Compass Reading- The third teaching station offered tips on knowing where you are and how to get to where you want to go. 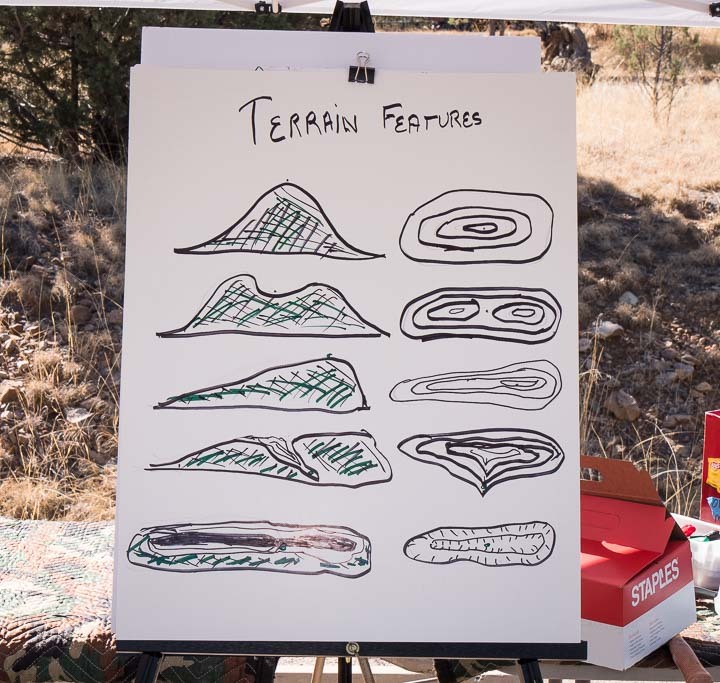 023 The Lay of the Land- Recognizing topographic features are part of navigating the land. 025 Learning How to Tie a Fly- At another learning station, Rick Weisberg helps a JAKE tie an enticing fly. Rick is a member of the San Pedro Fly Casters. 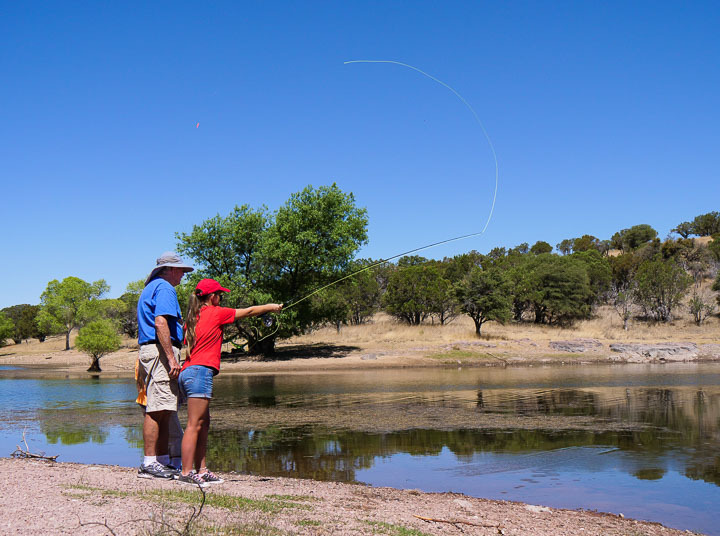 026 This Is How You Cast a Fly- At the Fly Fishing Station, John Marvin demonstrates the fine art of fly casting for 2 JAKES. 027 Your Turn- Now a JAKE takes a turn at doing what John just showed her. 028 Another Fly Caster- A second JAKE learns fly presentation quickly with the help of John Marvin from the San Pedro Fly Casters. Look out fish! 029 End of Day Auction- After visiting all the stations, B.A.S.S. Nation finished the day with an equipment raffle for the JAKES. Jacob Shull and Gerald Kimzey (behind Jacob) call out a winning number. 031 Winding Down at the End of a Great Day- Lorin Kaiser enjoys a comfortable chair and a view of the lake at the end of the JAKES Day. What a good setting for learning new outdoor skills. 030 JAKES Portrait- The successful 2017 JAKES pose for a group picture with Parker Canyon Lake in the background. Congratulations! 032 See You at the August 5th Banquet! 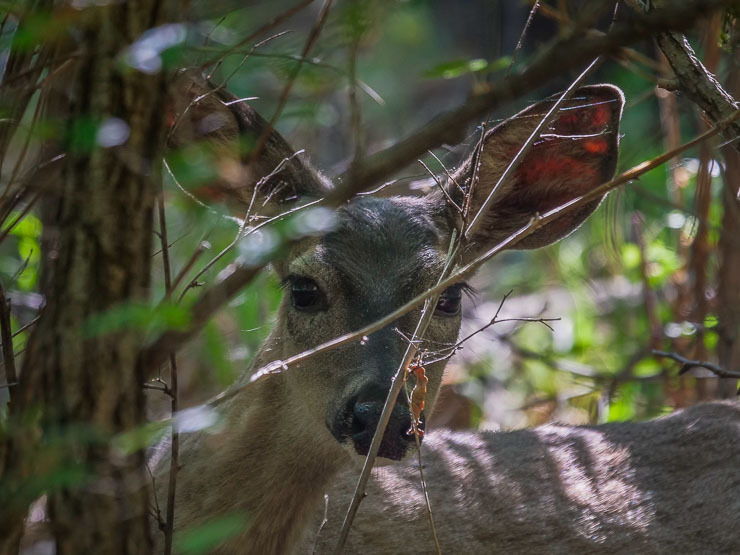 Don’t be bashful. 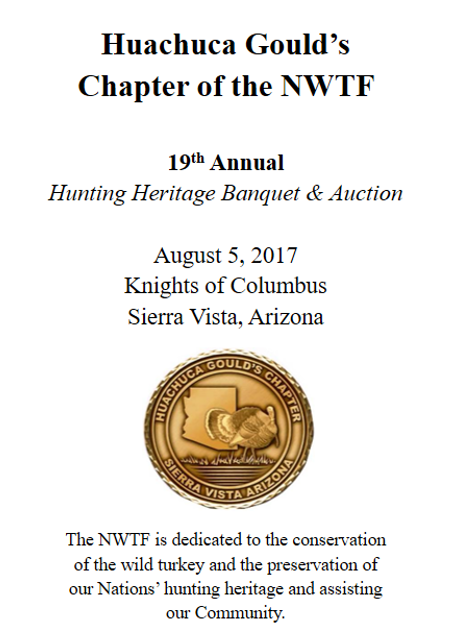 Plan on attending the August 5th Heritage Banquet of the Huachuca Gould’s Chapter. Monies raised at this banquet will help support future JAKES Days and other Chapter community oriented events. 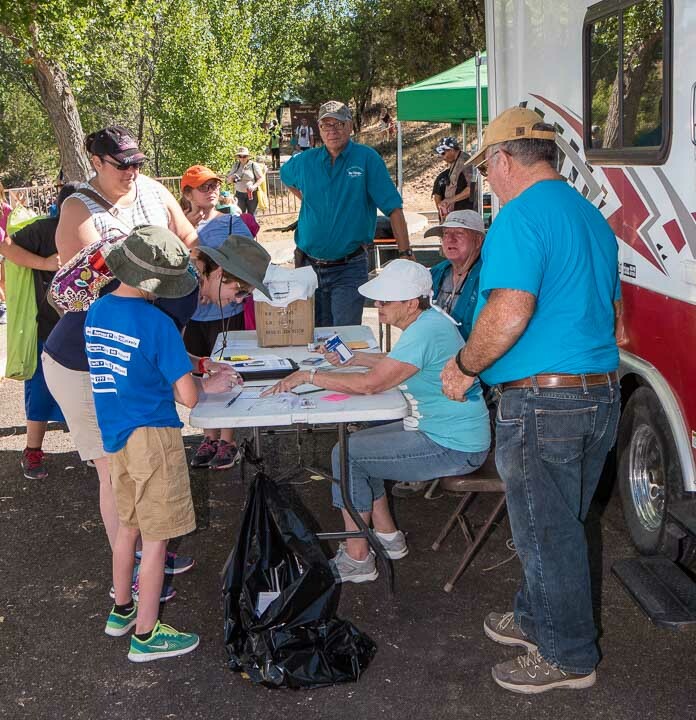 ​Thanks goes all around to our participates, guest, sponsors, board member, and of course, Tom Deecken for taking the time to capture another great event.